Thanks for visiting my blog. 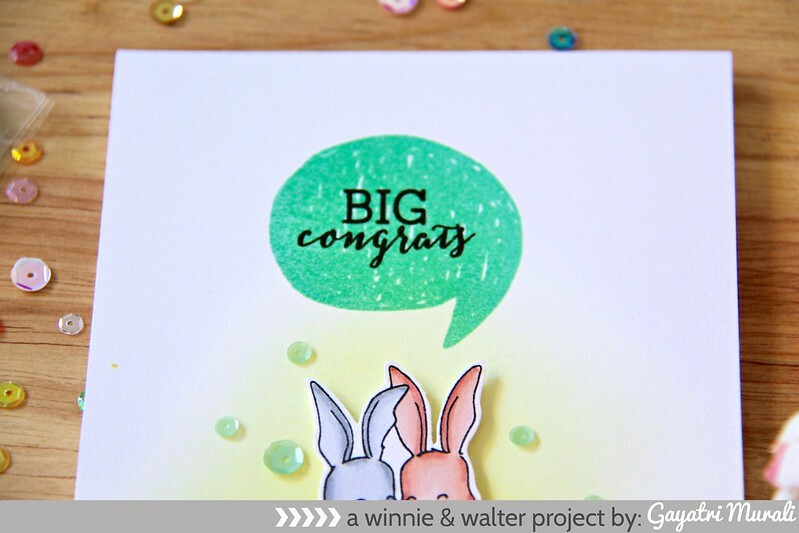 Today is day #3 of Winnie & Walter’s New Release. Here are my Day #1 and Day #2 projects. I am showcasing Sketchy Thoughts stamp set today. 1. I stamped the bunny image from another newStamp set and copic coloured the image. 2. I die cut the image out with scissors as I am yet to receive the dies for the set. There are coordinating dies available. 3. On the bottom of the white card base, I stamped the inverted triangle border stamp from the new Scenery: Stripes 2 stamp set in black. 4. I trimmed a white cardstock to 4.25″ x5.25″. I sponged Squeezed Lemonade distress ink on the bottom centre of the panel. 5. I placed the bunny image on the sponged area to get an idea to stamped the speech bubble from Sketchy Thoughts stamp set. 6. I stamped the speech bubble using Mint Julep ink, the sentiment in black and Versamark on top of the dye ink so that I could clear heat embossed the image. 7. The bunny image is adhered in place using foam adhesive. 8. I added a strip of mint cardstock at the bottom of the panel before I adhered the panel to the card front. 9. I embellished with sequins from Pretty Pink Posh. Couple of closeups of the card for you. 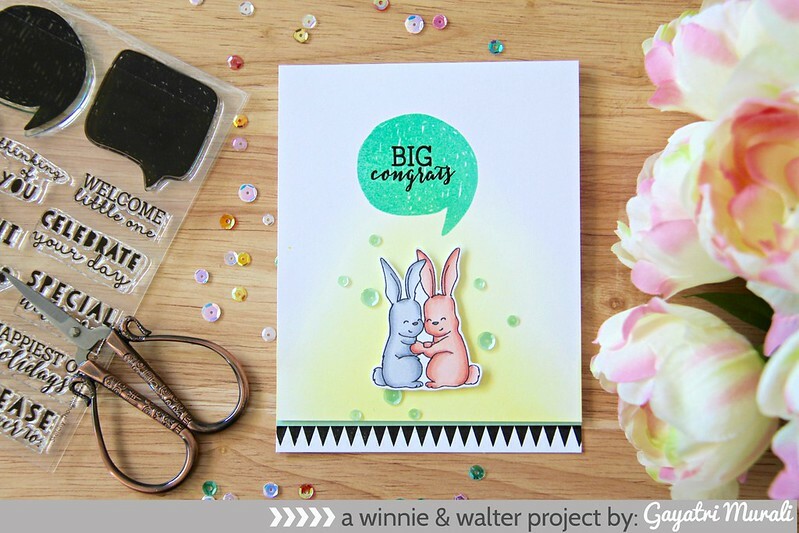 Check out Winnie & Walter Blog for more inspirations from the Design Team and more details about the Big Giveaway. Thanks once again for stopping by my blog today. 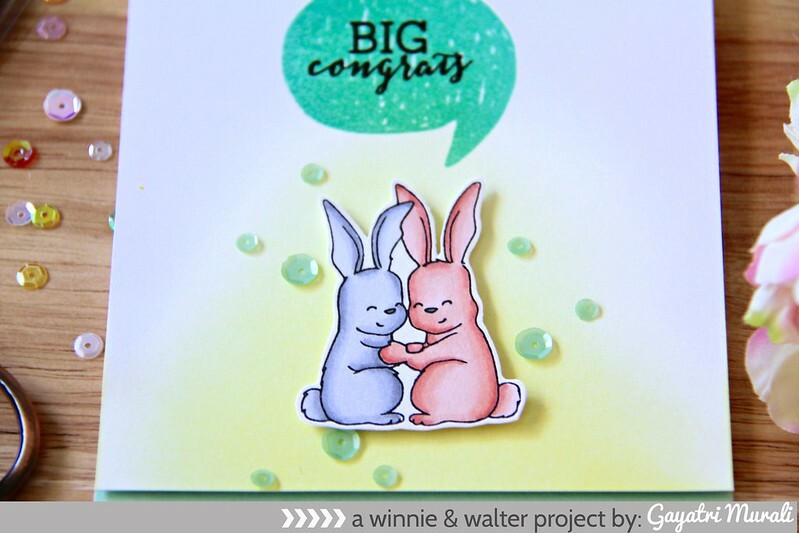 I will see you tomorrow with Day #4 of Winnie & Walter new release. Oh Gayatri, this is absolutely precious! What a beautiful card. These bunnies are just way too darned CUTE! Thats so cute Gayatri! I'm definitely going to get the new stamp sets with the animals, just what I needed! So sweet – just look at their expressions!! !